Whether you run an upscale bistro, family restaurant, or casual buffet, having the appropriate dinnerware for your menu is crucial. 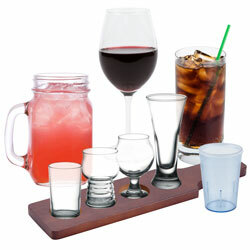 Our wide selection of beverageware includes a variety of shapes, styles, and materials, so you can find an option for every drink on your menu. No table setting is complete without the appropriate flatware and utensils. 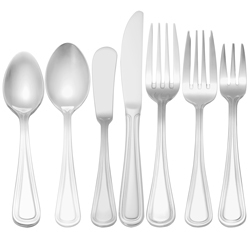 We carry many styles of forks, spoons, knives, and specialty utensils. 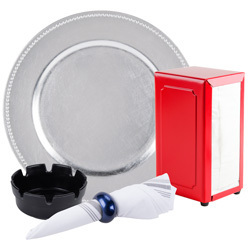 From fast food baskets to gravy boats, we carry all the serving and display ware you need for your establishment. Boost the appeal of your dining room or event with decorative fountains, lamps, candles, vases, signs, and other tabletop display and decor pieces. 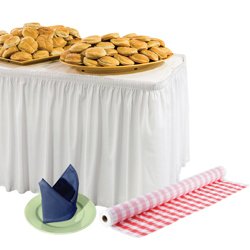 Whether you need a vinyl table cover for your picnic or table skirting for your banquet hall, we offer an array of linens and table coverings. 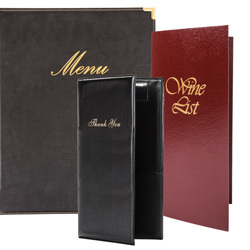 Our menu holders and guest check presenters add a level of sophistication to your establishment. 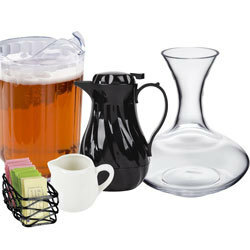 Whether you’re pouring wine or offering creamer for coffee, we have all the tabletop beverage service supplies you need. 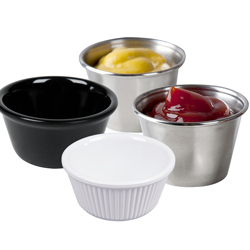 Give your guests a convenient, stylish container to hold their favorite dips, sauces, dressings, and sides with our ramekins and sauce cups. Find the perfect finishing touch for your table setting with tabletop accessories like charger plates, napkin rings, spoon rests, and more. 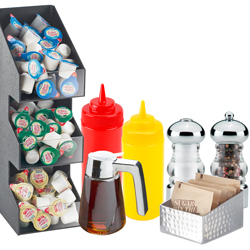 Keep your condiments neatly organized with our condiment holders and dispensers, such as spice shakers, condiment bins, and sugar caddies. 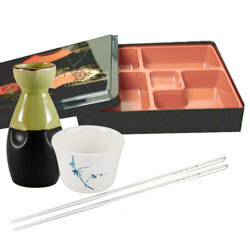 Whether you’re looking for sake cups, sushi boats, or bento boxes, we have all the Asian restaurant tabletop supplies you need. 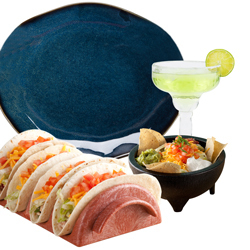 We carry many Mexican restaurant tabletop supplies, including margarita glasses, colorful china plates, tortilla servers, taco holders, and more. Whether you're running a casual fast-food business or an upscale restaurant, we have the restaurant tabletop supplies you need to customize the appearance of your establishment. You can even find themed products that can be used in any Asian- or Mexican-inspired restaurant, so you can provide your customers with a cultural experience. 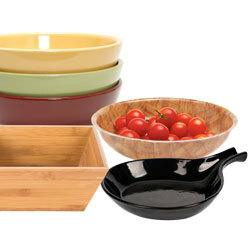 Browse our varied selection of dinnerware essentials for meal service, and get creative with our decorative accessories! For more front-of-house options for your establishment, be sure to check out our restaurant seating, restaurant tables, and light bulbs and lighting products. If you're wondering where to buy tabletop, we have a large selection of tabletop for sale at the lowest prices. 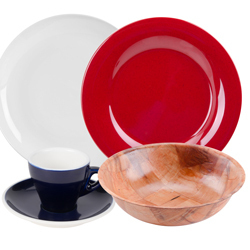 Choosing the right type of disposable dinnerware is a big decision for your business. Simplify your selection process by learning about the various options available, including the benefits and limitations, so that you can choose the best fit for your business! As a restauranteur, you know that traditional cloth napkins have a time and a place in the restaurant and catering industry; however, did you know that innovations in disposable napkin materials are making them a serious contender in applications once dominated by their cloth counterparts? Gone are the days where commodity paper napkins were the only other alternatives to traditional cloth napkins. Today, linen-feel napkins offer a step up from 2- or 3-ply paper napkins, while ensuring a thick, soft, and highly-absorbent option that matches the look and feel of actual linen. Linen-feel napkins are available in a variety of colors and patterns to match any place setting, and they are guaranteed to add an upscale look to your establishment. Some of the most necessary restaurant tabletop supplies we carry are our linens and table coverings, which are available in a variety of sizes and styles to suit any decor or theme. We offer a wide selection of menu holders and check presenters, as well, so you can provide professional customer service! 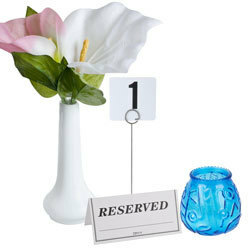 Be sure to also keep your customers' tables well-equipped with our decorative condiment holders, pourers, and shakers. Highlight your place settings with elegant display and decor pieces to create unique tabletop displays. Use charger plates for multi-course meals, and use bud vases as centerpieces. You’ll find more elaborate tabletop supplies, such as fountains, that will create attention-grabbing beverage and dessert presentations. Don't forget that simple table lamps and candles are also great accessories that help make customers feel warm and welcomed.